For most men, the wool suit is reserved for work only; for others, a suit can pull double duty in both work and social situations. Mens linen suits are a perfect complement to the foundational pieces often found in the typical business wardrobe. Learning how to mix and match your colors, patterns, and fabrics is key to asserting yourself as a sophisticated adult. The ability to put together an outfit separates the men from the boys because it allows you to define your fashion individuality in perfect harmony with the spirit of the 1920s. Though we see ourselves as much more fashion savvy today than those poor guys in the 1920s, we can learn much from the fashion victories and faux pas of the past. 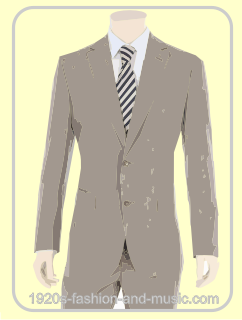 Linen is a difficult fabric to work with, thus it is difficult to make a suit from it. It creases easily leading to a wrinkled and crumpled look even after normal wear around the office, in the 1920's and today a crumpled suit is a definite no-no in most situations. Linen is not "traditional" suit material. Typically the material is reserved for white handkerchiefs and pocket squares. 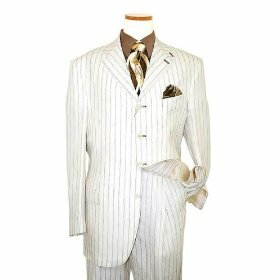 If you really want to buy men's linen suits insist on Irish linen, it comes in many different weights, from silk thin to tweed thick, and you will have many colors and patterns to choose from. Linen is a great choice for a "Summer Suit"--despite the material's drawbacks, linen is a wonderful choice for a light breathable suit that will help you beat the dog days of summer. Many gentlemen don't mind the deep creases that linen gets; some guys even regard them as "distinguished", and feel they lend character to a suit's appearance. Get the right size - For God's Sake please get the right size!!! Given linen's tendancy to wrinkle, the last thing you want to do is buy a suit that makes you look like a Shar-Pei. Two is better than one. Like a good pair of shoes, you should always allow your linen suit to hang for several days after wearing it. Linen is not a hard working fabric. Linen loses shape fairly quickly do to the light weight of the fabric. b) Wrinkles don't usually "fall out" when hung up. So when you wear your men's linen suit to work, make sure you have a spare suit for the next day. Despite the difficulties of the fabric, mens linen suits are definitely comfortable, come in many weights, and you have a selection of patterns and textures to choose from.